Had a good weekend I hope? It was lovely to have Mark home for the weekend it was just lovely and we had a great time. I must say I am finding it a bit of an adjustment having him home at "normal" hours but so glad to have him with me after all thees years of working crazy hours. He left again this morning for his 2 hour drive to work so will be looking forward to him returning on Friday. So from now till then I guess I will be stamping...................Yippee. This is what I have been up to today hope you like it. This Stamp set is the level 3 hostess from the new 2008 - 2009 catty which will be launched in April. Every year Stampin Up! sends us demonstrators a gift around Christmas and this year it was this stamp set Time well spent, it's so cute and fun. The box was downloaded from the Stampin Up! web site as a demonstrator I have access to all these fabulous resources. 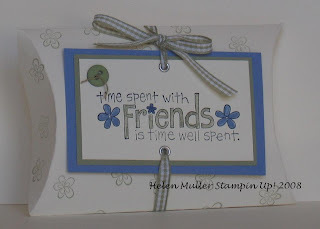 I first stamped the words with Sazon on very vanilla card and coloured the words in with my markers ,mellow moss and ballet blue. The vanilla card was then layered on Mellow moss and ballet blue card. I wrapped the hemp twine round the button and tied a knot, adhering it to the card with crystal effects. The silver eyelets where then attached and moss gingham ribbon threaded through and tied into a bow. The background of the box was stamped using the little flower from the same stamp set using mellow moss ink.